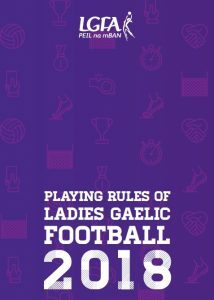 Below is a brief version of the playing rules of the Ladies Gaelic Football. The full version of the Playing Rules is contained in the Official Guide. The Playing Rules are available in six different languages and all can be downloaded in the Overseas Section. These are English, Irish, French, Spanish, Catalan and Estonian. It’s aim is to try to ensure that all players and officials read and learn the rules. It is important that teachers and coaches ensure that all their players have a copy of this booklet. This will improve their understanding of the game and help them to accept the decisions of the officials without dissent. This booklet emphasises the importance which the Association places on promoting a better understanding of our game. Click here to view Playing Rules in Irish.